Pork belly seems to have a revival over recent years and can now regularly be seen on gastro pub menus. I remember when I was growing up that it was something that my mum used to cook as a cheap mid-weeek meal, and although it’s still reasonably priced compared to other joints, it’s not what I would call “cheap” anymore, probably because there is an increased demand for it and so retailers can get away with charging higher prices. When choosing the meat, try to get outdoor reared pork as usually this has a thicker fat layer than intensively reared pork. I know that we’re all being told to try to cut down on fat in our diets, but it’s the fat that adds flavour to the meat, and also during the long slow roasting, it’s the fat that helps to keep the meat moist. 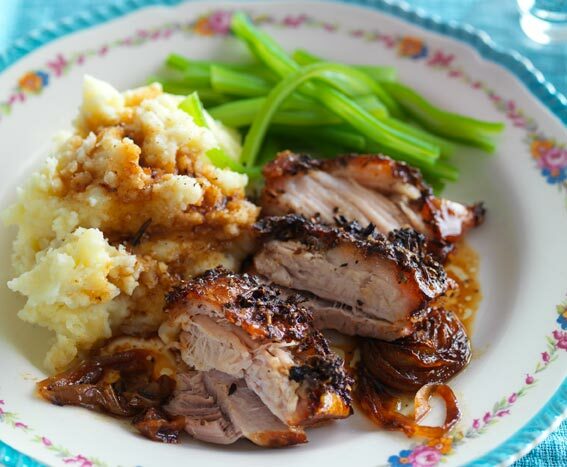 If you’re after good crackling, slash the skin of the pork. Usually when you buy it it comes with some cuts, but I usually add a few more, or make the existing cuts a bit deeper using either a small sharp knife or a craft knife. If you’re buying the meat from butcher, then you can ask them to do this for you. Then pour a kettle of boiling water over the skin, which will make the skin start to contract and open up the cuts so that the heat can penetrate the skin more easily. Pat the skin as dry as you can using absorbent kitchen paper, then leave it out, uncovered for a while until the skin is dry. If there’s still any moisture then it keeps the skin moist, so the skin doesn’t crisp as well. I usually leave it for 30 minutes to an hour, but you can speed up this stage by using a hairdryer on a cool setting to dry the skin. Meanwhile, turn the oven on to it’s maximum setting and let it heat up before putting the meat into the oven. I find it best to rub dry seasoning into the skin, making sure it goes into the cuts in the skin. There seems to be some debate as to whether to brush oil over the skin, but in my testing I found that kept the skin softer, so after waiting for the skin to dry, I wasn’t then going to moisten it again with oil. And although it means that the oven will get more dirty as the fat will splatter, it’s best to leave the pork uncovered otherwise if you cover the dish then the skin will steam and stay soft rather than crisping. After about 30 minutes at a high heat, I then turn the oven temeprature down to cook the meat through. When the juices run clear when the meat is pierced, then it’s ready. If the skin still doesn’t look very crisp you can either finish it off under a hot grill, or if you have a multi-function oven then put it to either top only heat or a grill with fan (turbo grill) setting to crisp it up. 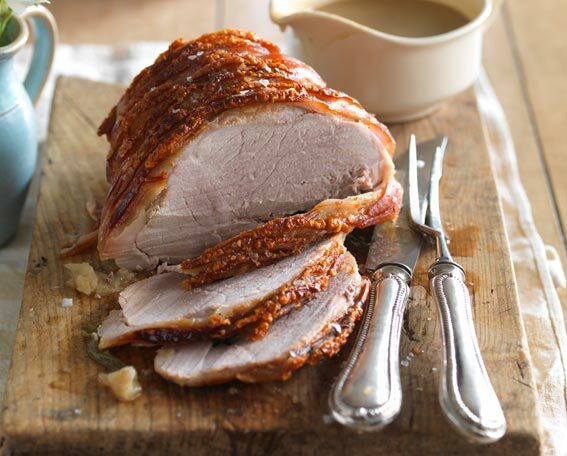 This basic principle for getting crispy crackling applies to all cuts of pork with skin on them, so it works for a traditional roast leg or shoulder joint too.